Below you can find driving directions from Google Maps to help you get from Fort Lauderdale to your nearest Fix Apple Now store, situated in Hallandale. You can either copy the driving instructions below or click here for a larger map and driving directions. Do you need to mend, replace, restore, reset or fix your iPhone 4,5 or 6, iPad, iPod, MacBook or Apple Mac in Fort Lauderdale? If so, talk to Fix Apple Now today. At Fix Apple Now, we have the ability and resources needed to deal with a whole host of problems and can be counted on to deliver the exceptional quality you're looking for. Talk to us today if you've got an unresponsive touchscreen, your device won't turn on or off, you can see unwanted enlarged icons, have red screen, can hear crackling in your headphones or are experiencing all sorts of strange behaviour. Whatever the problem is, there's a big chance we can put things right for less. We always aim to resolve your issue quickly so you can be reunited with your beloved device within days – whilst always getting to the very root of the problem. 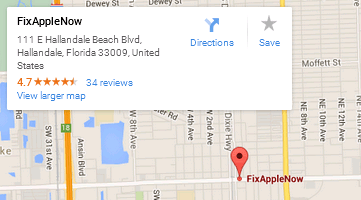 Why head elsewhere if you need to fix your Apple in Fort Lauderdale? Talk to us today.